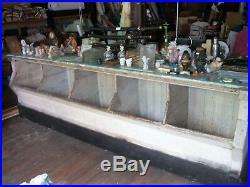 Antique Vintage General store counter top display early 1900s or earlier. This counter is still in the old general store from way back when. 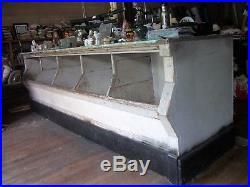 Many years after the general store closed my mother and father bought the building with this counter still in it. My Mama is 89 years old now. Sadly my dear Daddy has been gone for several years now. He would have been 99. Which was believed to of sit on this very same counter. Many years ago there were five general stores in the county I live in. This old store building was one of them. The building was last used as a flea market. It still has many items in it, including two old office desk one metal, one wood also has an old cash register, all for sale. The counter is made of hard wood. Its very sturdy, heavy and holding together very well. Someone has put contact paper on top of the counter, which can be removed and refinished. My Mama said they use to put beans, corn and such in the bins in the front of the counter. Hard to find a counter with the bins in them. Theres also shelves on the other side of the counter where you can store items. 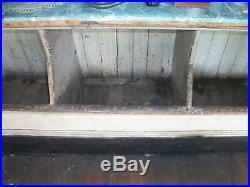 The top of the counter measures 9 (feet long)x 28 1/2(inches wide) The depth from front of the bins to the back is 31 1/2(inches deep) x 35(inches tall). If you have any questions please feel free to ask. Thanks for your time and may you have a blessed day. 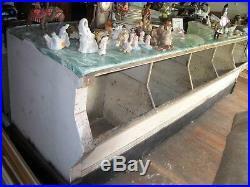 The item “Antique Vintage General Store Counter Top Display Early 1900s or Earlier” is in sale since Wednesday, November 14, 2018. This item is in the category “Antiques\Mercantile, Trades & Factories\Other Mercantile Antiques”. The seller is “imstillblessed” and is located in Saltville, Virginia. This item can’t be shipped, the buyer must pick up the item.